A haunting love story with a supernatural twist set in war-torn France and present day London. -James Buchan, author, former correspondent for the Financial Times, and journalist at the Guardian Review. This is a must have book. The storyline and later twist will have you wanting to read more and more, i couldnt put it down! Can’t wait for the author’s next book! A superb read…… I was engrossed from beginning to end. If you haven’t read it yet…… YOU MUST! Highly recommend. Victoria Mosley may be better known for her poetry,but her first novel is definitely worth purchasing. Moving and gripping, this is a story with a real sense of poetry and dreams. 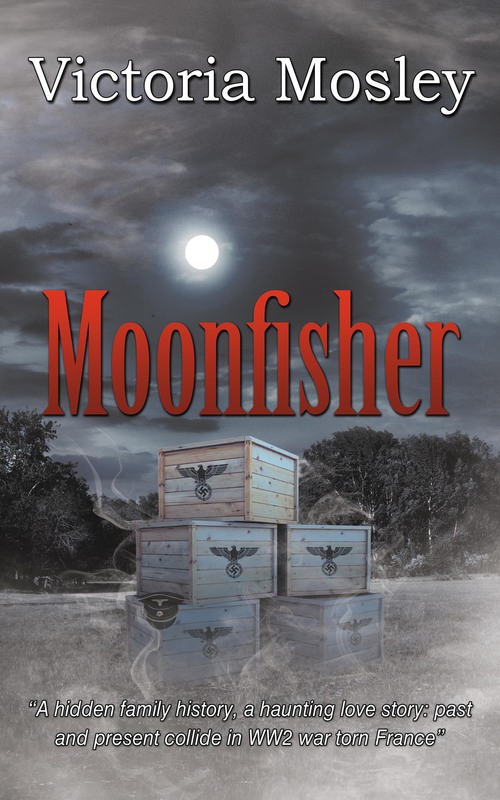 Moonfisher is a page turner right from the start. I struggled to put the book down until it was finished. It has everything; love, intrigue, war and strong characters – even right down to the very satisfying ending. The author takes the reader back to wartime France by vividly recreating what it was like to be a secret agent – not knowing if today was going to be your last – and what it was actually like to be in France at that time. The book is very well researched and describes in the right amount of detail the activities of the Special Operations Executive, in particular the role women played in the organisation, which is the focus of one of the central characters. The author’s research on the Das Reich Division is also noted, weaving in actual events for which the Division is notorious. I liked the linking from modern day London before being transported to the sounds, sight, smells and fashion of 1940’s France, then back again. In this regard the narrative hangs together very well.I would highly recommend this book and look forward to reading more of this author’s work. She wakes up this morning dreaming of her own death. The early London light is creeping under the blinds, another grey September day, the usual hum of traffic on the distant highroad. Turning onto her side Violet throws an arm over the supine figure of her boyfriend, shuts her eyes and tries to return to that undiscovered world of dreams that she often longs to inhabit permanently. To begin with, all she can hear is the rhythmic breath of Nat by her side and the lugubrious snores of their five month old puppy that has sneaked under their duvet yet again. Then the red retina mist fades and she is back in the dream, her heart pounding and her breath making smoke in front of her nose in the bitterly cold night air. She kicks out, her foot hits soft flesh and the puppy yelps. Again its daylight and London, 8.20 am and she has to get up.